Looking for a bright way to decorate your classroom? I was, too! That's why I created these posters and am now sharing them with you! Download and unzip the file to print these from one of two different file formats--PDF or JPEG. 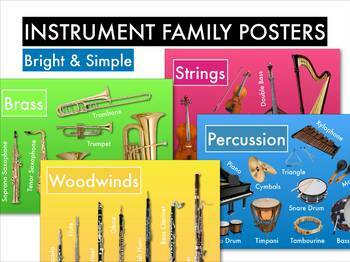 There's a separate poster for each family--Brass, Woodwinds, Strings, and Percussion--that includes examples of instruments from that family and their respective names. 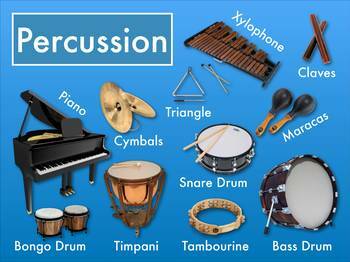 That's a total of four posters for you and your students to enjoy! Please note: These posters are NOT editable. 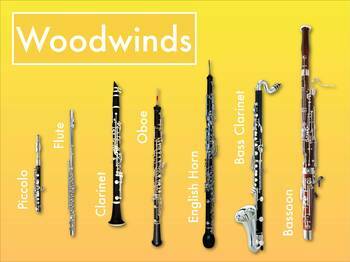 If you do purchase this product, please rate and review it to let me know what you like or how I may improve. My goal is to create quality products for my classroom that I can share with other teachers, and, as you know, feedback is essential for growth!